A partnership between a Wirral community and Openreach has marked a major milestone in the roll-out of high-speed fibre broadband across the UK. Organisations and residents living in Barnston on the Wirral are the 500th community in the UK to sign a joint funding deal with Openreach, the business responsible for Britain’s largest phone and broadband network, to get the high-speed fibre technology. The project is the first to be signed in Merseyside and will bring ultrafast Fibre to the Premises (FTTP) broadband capable of speeds up to one Gigabit Per Second (Gbps) to Barnston – more than 20 times faster than the current average broadband speeds in the UK. Organisations in the community, led by Barnstondale Activity Centre, are funding the fibre broadband with the help of an education grant of nearly £25,000 from Openreach’s Community Fibre Partnership (CFP) programme. Under the CFP programme, communities can apply for a BT Group grant of up to £30,000 towards the cost of getting superfast or ultrafast broadband with Openreach if the new technology will also benefit a local school or similar organisation. One of the organisations to benefit from the arrival of the ultrafast fibre broadband early next year will be Barnstondale Centre. The charity, which supports young people, welcomes day visitors and residential guests to enjoy its many facilities and is an inclusive centre, which means it provides adventures and outdoor activities for all ages and abilities. Heidi Hughes, business director at Barnstondale, explained the great benefits fibre broadband will bring to visitors to the centre. She said: “The fibre broadband will help us bring nature and IT together.When children come to stay with us, they will be able to take photos on their tablets and phones of the plants and wildlife at our centre.They can then use the new wi-fi to upload the photos, to help them identify and research what they have seen. “The broadband will also be beneficial for the 15-17 year olds who are on the National Citizen Service (NCS) programme, as we’ll enable them to stay connected during their visit. For those who visit us with additional needs, their carers will be able to access their medical records online. Longcroft Christian Fellowship, Christ Church, the Fox and Hounds pub and J O’Grady Salvage and Stone are four of the other organisations in Barnston who have funded the project and are set to benefit. Morris Rowlands, Deacon of Longcroft, said: “The fibre broadband will provide us with a much quicker speed to provide an improved service for those using our premises or staying with us. “In the past, the situation has been challenging and has caused headaches. The fibre broadband is just the prescription to relieve them. Celebrating the signing of the CFP agreement at Barnston, Margaret Greenwood MP for Wirral West, said: “I would like to congratulate the organisations and residents who have been involved in this initiative. 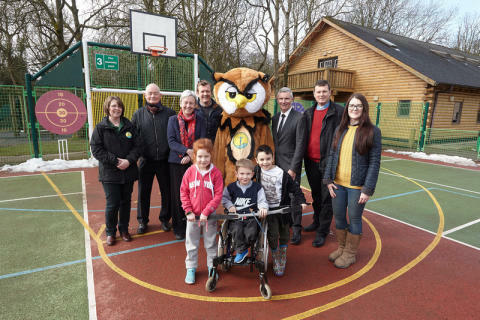 The Barnstondale Activity Centre has led the project, and there has been tremendous support from numerous other organisations and businesses locally. “Thanks must go to Openreach for working with the community and providing the grant so that the local area can benefit. Tony Morgan, business development director for Openreach, said: “It’s been great working with the people and organisations of Barnston to find a fibre broadband solution, which best meets their needs. This small Merseyside community has marked a major milestone in the success of a UK-wide scheme, which is bringing high-speed broadband to some of the harder to reach locations. “We know how important fast internet is to communities and are working with residents and businesses up and down the country to make this exciting technology as widely available as possible.